Should Priests Wear their Collars? Msgr. Dolan always wears his clerical collar. In fact, when he was interviewed by CBC Television’s Evan Solomon last year during the height of "The Da Vinci Code" movie controversy, he showed his empty closet, bare except for a few black shirts and slacks off the sparely furnished bedroom bed at his residence in Montreal. He said the clerical garb signals to others, "I exist for you. How can I serve you?" "It pays to advertise," he said, smiling. He often has people coming up to him, asking for prayer. He now makes a practice of going to the train station or the airport at least an hour early so people can approach them. "If priests are invisible, that shuts down," he said. 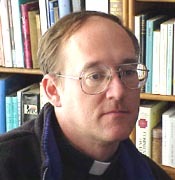 Our priest, Fr. Ed Fride of Christ the King in Ann Arbor MI (picture to right), tells this story which he vows is true. While wearing his collar (which he always does) in a restaurant he began to eat his peas. He heard God's inner voice saying, "Eat your carrots first!" He set down his peas and ate the carrots. Instantly a woman at a nearby table burst into tears. He got up and went to her. "Can I assist you in any way?" She responded, "You already did; you ate your carrots first." "Yes," he said "I did." She responded, "I had decided this would be my last meal. I was going to kill myself today. But since you were their with your collar I gave God one more chance. I told him that if He cared at all for me, to make you eat your carrots first." She is alive today thanks to a priest who witnesses for Jesus everywhere he goes because of his priestly garb. Thanks to all the priests who are such witnesses to Jesus and his love without even saying a word. …Pope Francis May Renounce the Papacy Someday: Six Things You Should Know and Share.